The Chinatown-International District (CID) Framework and Implementation Plan effort was initiated in the fall of 2016 in response to community priorities that were identified by the CID Public Safety Task Force (see "Project Documents" tab for a link to their report). Design and carry out a culturally-relevant and responsive community involvement process, building on and improving partnerships between the city and community members. 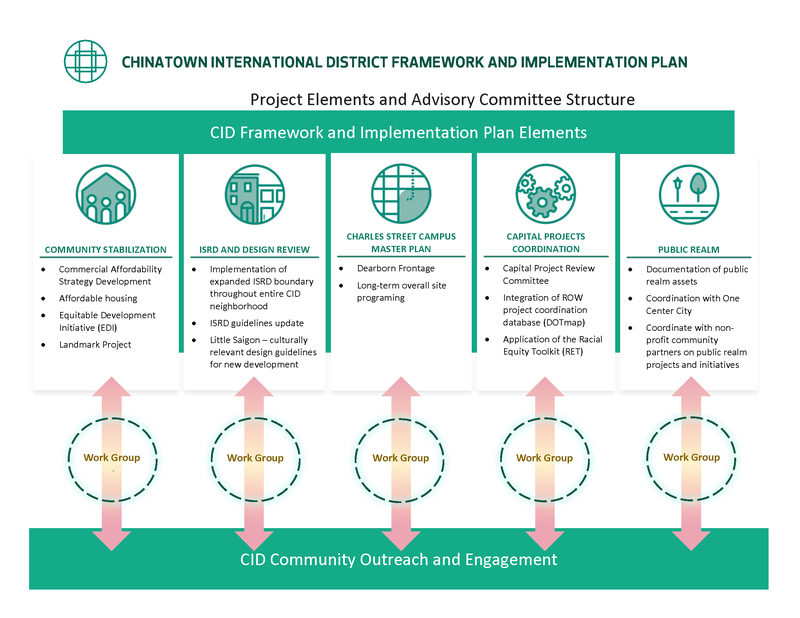 The illustration below shows how the CID Framework and Implementation Plan work was structured into five Elements, each with a workgroup comprised of community members and City staff working on recommendations for policies and strategies to improve the CID. The CID Framework and Implementation Plan work to date has served as a vehicle for documenting, communicating and guiding the development of recommendations related to the five key priority areas. The CID planning project has been going through a period of reevaluation and reorganization. Related to those discussions, the Mayor's budget for 2019 includes $200,000 to support further culturally relevant outreach, in-language engagement and funds to support near-term work on under I-5 activation. A 2018 Status Report was prepared to support the CID Framework conversations regarding next steps; to provide a summary of the work completed by each workgroup to-date; and to serve as a resource for the ongoing work to support community action and investment consistent with community-defined priorities. Preliminary recommendations for strategies and tools to help preserve affordable commercial spaces in the CID. Preliminary recommendations that enhance affordable housing strategies in the CID. Development of draft ISRD guidelines that include guidelines for new development in the CID. Completion of a consultant report on the feasibility for transitioning City facilities out of the Charles Street Campus property. Creation of a forum for improved communication with the community regarding capital improvement projects in the CID and better coordination of their implementation. CID Public Realm maps documenting existing, planned and potential future public realm improvements in the CID and preliminary recommendations for public realm improvements. We are partnering with community stakeholders (residents, community organizations, business and property owners) to help develop strategies that respond to the CID community's priorities for future investments and improvements. For information about the CID community engagement process and 2019 work plan, please contact Jenifer Chao at the Department of Neighborhoods, jenifer.chao@seattle.gov. You can also sign-up for our listserv to receive updates about this project (see email form on the right, or scroll down to the bottom of the page if you are viewing this page on a mobile device). Five Workgroups were formed to focus on the five Elements of the Framework and Implementation Plan. Each workgroup is comprised of community members who have expressed interest, and City staff members who support each workgroup. Community priorities guide each workgroup's work. The following is a summary of the activities of each workgroup through mid-November of 2018 (also see 2018 Status Report). The future work of each workgroup will be informed by further community outreach that will be taking place during 2019. See "Project Documents" tab for meeting notes and work products of each workgroup. This workgroup was established to consider a range of strategies to preserve affordability and address potential displacement of small businesses, including non-profit organizations, that contribute significantly to the neighborhood's cultural identity. This workgroup also focused on strategies to ensure that development pressure does not result in displacement of the neighborhood's affordable housing resources and encouraging a healthy mix of housing at various levels of affordability. The Office of Planning and Community Development, Office of Economic Development and the Office of Housing supported this workgroup. The CID neighborhood previously fell within the catchment area of three design review areas. On January 1, 2018, the ISRD boundary was officially expanded to include the entire CID neighborhood. This workgroup informed the development of draft ISRD design guidelines and will also helped identify potential amendments to the Land Use Code. Department of Neighborhoods Historic Preservation program, OPCD and SDCI staff support this work. The CID community has long expressed a desire for the City to engage in a process to explore the feasibility of transitioning current City uses out of the Charles Street Yard facility, to provide opportunities for broader community use. This workgroup worked with the City's Department of Finance and Administrative Services (FAS) in scoping and review of a consultant study of the potential to surplus some or all of the Charles Street Yard to provide future redevelopment opportunities. The consultant study focused on departmental operational needs, tradeoffs and costs and benefits of various options. The consultant study was completed in the Summer of 2018 and concluded that relocating current uses is prohibitively expensive. In light of the study findings, this workgroup has decided to discontinue meeting. This workgroup creates a forum for City and CID neighborhood review of planned City and other major public capital projects to ensure coordination, look for leveraging opportunities, consider project timing and to inform outreach and mitigation efforts. The Department of Neighborhoods has a lead coordination role. Senior staff from City capital departments are participating in this workgroup. This workgroup reviewed existing and proposed public realm/open space assets and identified a list of possible future improvements. Elements include park development, streetscape improvement projects, transit hub area improvements and other projects. The Office of Planning and Community Development, Department of Transportation (SDOT) and Parks Department supported this workgroup. See the CID 2018 Status Report for a summary of work through November 2018. The CID Framework and Implementation Plan builds on the work of many as represented in these studies and plans that have captured the community's vision for the future.